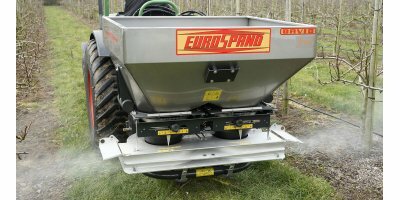 David Fruit/Compact Fruit - Localised Inter Row Spreaders - Carried Localized Inter Row Fertilizer Spreader by Eurospand Cavallo S.r.l. The most versatile, efficient fertilizer spreader on the market for the inter-row localized, full field or green-houses distribution. The absence of inner agitators improves distribution, does not produce powders, enables the spreading of mineral fertilizers, organic amenders and seeds reducing the dosage to apply. Scroll down to discover all advantages. Curved tubes and conveniently shaped round edges to avoid the sediment of powders of fertilizer and guarantee maximal sturdiness. In these versions the required dosage is automatically adjusted according to the forward speed (Forward Speed Calibration) by means of two linear actuators. The system enables the instantaneous variation of the applied dosage, the interruption of spreading on one side, the verification of the worked hectares directly and comfortably from the tractor’s seat. 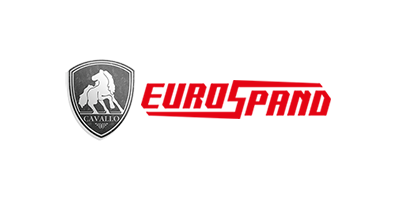 La nostra azienda: Eurospand Cavallo produttori di spandiconcime da più di 40' anni. Tecnologia e qualità a fianco dell'agricoltore. Spandiconcime centrifugo a doppio disco per distribuzione localizzata su filari da 2 a 5 m. (per frutteto e vigneto) o a pieno campo con larghezza di spandimento fino a 12 m.
No reviews were found for David Fruit/Compact Fruit - Carried Localized Inter Row Fertilizer Spreader. Be the first to review!